For over 20 years, I have led groups for people living with life threatening illnesses. 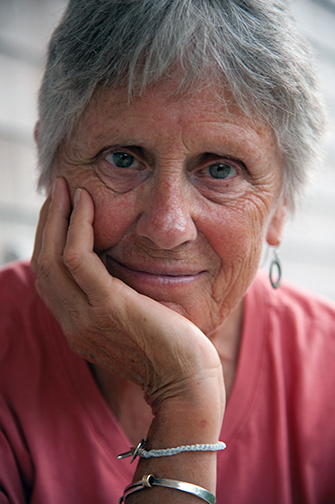 In therapeutic writing and other support groups, members seemed to gravitate towards a few essential themes as they sought to gracefully close out their lives. Almost universally, group members expressed the need and desire to feel known by family members and loved ones. They wanted to be remembered, to feel that their lives had made a difference. They wanted to pass on important life lessons to the people they cared most about. 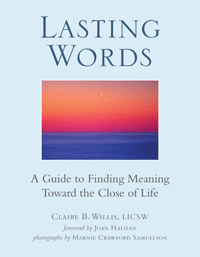 I wrote LASTING WORDS to try to illuminate some of these end of life issues and concerns. I began my professional life as a clinical social worker. For years, I worked with people with cancer at the Wellness Community in Newton and later co-founded another non profit, Facing Cancer Together in Newtonville, MA, where we continue to run support and educational programs. In addition to my group work, I teach yoga, am an ordained lay Buddhist chaplain, and an adjunct faculty member at Andover Newton Theological School. I hold an MA from the Episcopal Divinity School and an MSW and M.Ed from Boston University. I maintain a small private practice in Brookline, Massachusetts. © Claire Willis. All Rights Reserved.